The phytochemicals although possess less nutritive value but can be quite beneficial from the aspect of providing protective and beneficial effects to the hosts affected with diseased conditions. However, they are not required by the humans for the maintenance of normal physiological activities. The basic background of their utility comes from the fact that the plants can protect themselves to a large extent from the attack of various pathogenic and other foreign agents through the production of certain chemical compounds. Although the characterization of the chemical compounds at present is paltry but the ones which have been characterized suggest that they can have applications even against human diseases. Accordingly, some of the phytochemicals and their natural sources have been known by now like isoflavones (soy), flavanoids (fruits) and lycopene (tomatoes). But the major problem in their usage is the inability of the human body to derive the essential factors from them through the necessary breakdown of the compounds. Here, comes the role of the probiotics which can provide better utilization of the phytochemical potentials for our body. Why Are The Phytochemicals Useful? The different phytochemicals seem to provide their beneficial effects through different routes each of which can be highly effective to render health benefits. 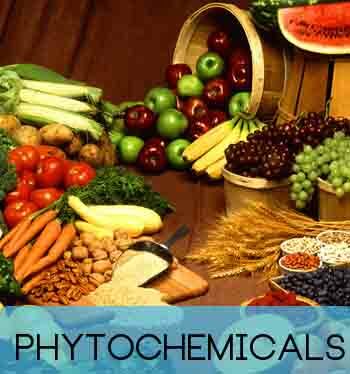 The phytochemicals possess oxygen scavenging abilities and protect our cells from oxidative stress. Isoflavones have been found to mimic estrogen as a result they can alleviate disease symptoms in women. The phytochemicals from garlic has anti-microbial effects. In addition, the phytochemicals can bind to the membrane of human cells that inhibits the pathogen adhesion. Other significant roles played by the phytochemicals are protease inhibition, interference with replication in cancer cells, etc. Therefore, they can be important therapeutic agents against human diseases provided they are utilized properly. The humans possess very low capacity to utilize the phytochemicals and absorb them within the small intestinal epithelia unlike the ruminants who have special ability to degrade the plant derived nutrients. Therefore, the unutilized nutrients of the diet supplements go on to reach the large intestine and are broken down into utilizable components by the inhabitant microflora residing there. Nonetheless, the phytochemical compound consumption is associated with significant health benefits in human beings. There have been instances of the gut microbiota playing important role to metabolize and release better absorbable and bioavailable forms of isoflavones, the aglycones. These microbes are also able to convert the resultant of isoflavone metabolism into more impact causing byproducts like the equol. The equols have been reportedly found to bind to receptors for estrogen than the original ligands (diadzein) meant for them. In the Western world, very few of the individuals on dietary diadzein supplements could excrete equols. With all that potential, previously only a few works on the probiotic effect on phytochemical metabolism have been assessed and they were mainly restricted to the studies related to utilization of the soy based isoflavones by the probiotic bacteria. However, in recent times there has been a paradigm shift on the studies related to the effect of probiotics on phytochemicals. With the pre-existing knowledge about the role of the gut microbes on the metabolism of phytochemicals, it was assumed that the administration of probiotic supplements could be able to yield better utilization of the useful plant compounds and produce more beneficial byproducts. The probiotics could render their effect either directly acting on the phyto-compounds or alter the activity of the gut microbiota or their enzymes to enhance their metabolizing capacity. The main enzyme involved in the utilization of phytochemical compounds is the β-glycosidase which can hydrolyze the glycosidic bonds present in the isoflavone like compounds to yield the beneficial aglycones. Accordingly, Tsangalis et al., carried out an extensive study on the Bifidobacterium strains that could synthesize the β-glycosidase enzyme and isolated four strains with the requisite enzyme producing abilities with some of them being able to convert diadzeins into equols. The B. animalis strain was able to convert diadzein into equol in post-menopausal women whose diet contained soymilk or soymilk fermented foods. A combined intake of Bifidobacterium longum and Lactobacillus acidophilus strains were found to increase the bioactivity and bioavailability of the compounds in the recipients as was evident from the higher release of equols through the excreta. A recent work that involved human trials with efficient designing of the parameters for the effect of probiotic intake on phytoestrogen metabolism has injected fresh interests in this field of research. The study proved for the generation of active forms of the phytochemicals when the individuals were administered with different combination of probiotic strains. Efforts are now carried out for the development of pre-designed food products that can provide the combination of phytochemicals alongwith the probiotic supplements. Jaiswal et al. performed a related study wherein they tried to produce fermented cabbage juice using the probiotic Lactobacillus strains under specific conditions of pH and oxygen. The results that followed from this study were very inspiring for the application of probiotics in this field. The growth of L. plantarum, L. rhamnosus and L. brevis was remarkably improved in the cabbage juice which is an important factor to use them as probiotic foods. The anti-oxidant capacity and the beneficial end products of phytochemical metabolism seemed to increase with the application of probiotics. The phytochemical containing food products are either in the form of polymers, glycoconjugates or esters which remain mostly biologically unavailable for the proper utilization by the human body. A number of Lactobacillus and Bifidobacterium strains have now been identified that possess the synthesizing ability of various isoforms of the phytochemical hydrolyzing enzymes. The variation in the enzyme isoforms may be correlated to the specific strain upon consideration. Therefore, a good knowledge about the probiotic strain and the enzyme isoform that it can produce could be critical in making the right choice of the probiotic product on offer. Also, in this regard prior information about the phyto-compounds should help in the selection process.